When a woman is diagnosed with breast cancer, men can be extremely helpful when it comes to treatment, recovery and everything in between. Commitment, openness to understanding the needs of others, helping to solve problems and honest communication are just a few of the skills men will have to acquire in order to be more helpful. These new challenges will come easy to some men, while others will have doubts and questions over whether they will be able to face the uncertain and serious tasks ahead. Regardless of how they face it, every man will need information, advice, and support to get through it. 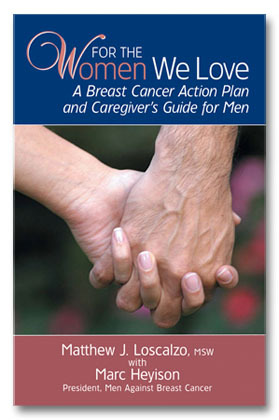 For The Women We Love is a no-nonsense, highly-focused guide for men who are serious about helping women recover from breast cancer. Rather than a long list of superficial social niceties and personalized emotive stories, this guide is a highly structured road map based on many years of practical clinical experience and scientific research about the most effective ways men can help women negotiate the complex problems and disruptions caused by breast cancer. Using a step-by-step problem-solving approach, it is a handbook for meaningful action. All too often with cancer, treatment, medicines, and doctor’s visits, couples lose sight of passion and affectionate sentiment. For The Women We Love will help recapture that tenderness with practical ideas and thoughtful solutions that will help rekindle the spark in your love life. With additional exercises and resource guides, For The Women We Love is a call to arms for men to support each woman’s struggle against breast cancer.